A computer's sound card converts digital data into analog sound that humans can hear. 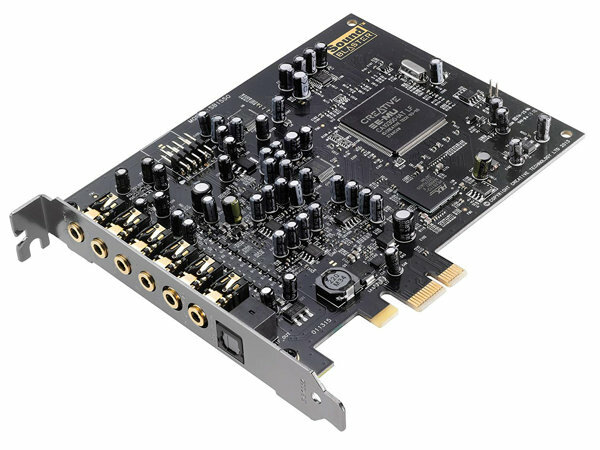 Most sound cards can also accept analog data through the card's microphone and line inputs and convert it to digital formats, making things like home digital sound recording and VOIP communication possible. Many also have MIDI (Musical Instrument Digital Interface) ports for keyboards, synthesizers, and other digital musical instruments. The first PC's had no sound card. They did have little tiny speakers through which users could hear the occasional beeps and alarms that the computers generated, but that was the extent of their sound systems. Nowadays, computer sound cards, including those integrated on motherboards, tend to be quite good. For most people, a decent set of computer speakers will make a bigger difference than an add-on sound card in terms of the quality of sound their computers can produce. There also are specialized sound cards for musicians that are designed to be used with professional studio recording software. But it's been years since I've built a computer for that purpose; so all I'll say is that if you're in that line of work, then you already know more than I do about all the latest goodies for people who make music for a living. When selecting a sound card for your homebuilt computer, the first question to ask yourself is whether you should bother with one at all. Even inexpensive motherboards usually have integrated (built-in) sound cards that are very decent and are good enough for the majority of users. You may want to just go with the integrated card, at least until you have a chance to hear it and decide if it's good enough for your needs. You can always add a sound card later. How important is computer sound to you? If you want to listen to (or create) music on your PC, then obviously you should lean toward a higher-end sound card or dedicated audio studio system. If music is your passion, then consider some of the very best cards. Are you going to be using your computer as the hub of a home theater system? If so, you may want something like a surround sound card like the Creative Audigy 7.1 card at the top of this page. This is also true if you're a serious gamer. What operating system are you planning to use? Almost any sound card will work with Windows, but if you are using Linux or some other operating system, be sure to make sure that card will work before you plunk down good money for it. What kind of speakers do you plan to use, and how many? All sound cards have universal connections for two speakers, but only some have connections for surround sound and other high-end sound schemes. If you are a professional musician, producer, or mixer, then you will want to purchase a sound system that is compatible with your instruments or mixing /recording equipment and software. Again, I'm not current on professional audio equipment, so I can't give any specific advice. Sorry. How much do you want to spend? Sound cards vary in price from a few bucks to hundreds of dollars (or even thousands of dollars for high-end professional equipment). As I mentioned previously, almost all motherboards come with integrated (built-in) sound. Depending on the quality and price range of the motherboard itself, on-board audio processors can range from good to excellent. As with integrated peripherals, however, even if the motherboard you're thinking about has good sound, I suggest you make sure that it also has expansion slots. This is because in the event that the on-board audio fails, or in case you later decide to disable the on-board audio and upgrade to an higher-quality sound card, you'll need a slot to accommodate it. Finally, as I stated before, bear in mind that most on-board audio cards are designed with Windows in mind. If you plan on installing a different operating system either as a sole OS or as part of a dual-boot or multi-boot system, make sure that the on-board sound will work with that OS before you spend any money on the board.